(Nanowerk News) A novel approach: Lithium-coated buckyballs to store hydrogen molecules in large quantities and operate under moderate temperatures and pressures. Virginia Commonwealth University researchers have developed a new storage system to hold large quantities of hydrogen fuel that may one day power cars in a more cost-effective and consumer-friendly way. This theoretical research moves scientists another step closer in the exploration of alternative fuel sources and methods to store hydrogen fuel. “We are going to face an energy crisis at some point in the future. It’s not a question of if, but when. There is a high demand on oil, particularly due to a growing global population,” said lead author Puru Jena, Ph.D., a professor of physics at VCU. Hydrogen is the most abundant element in the universe and considered an ideal energy carrier. When hydrogen burns, it produces only water and thus, does not pollute the atmosphere. For this reason, it is considered an ideal alternative when discussing theoretical alternatives to fossil fuels. In the Journal of the American Chemical Society, published online July 6, Jena and his team describe the theoretical composition of a material – a lithium-coated buckyball – that may have the potential to serve as a storage vessel for hydrogen atoms. A buckyball is a soccer ball-shaped nanoparticle containing 60 carbon atoms. 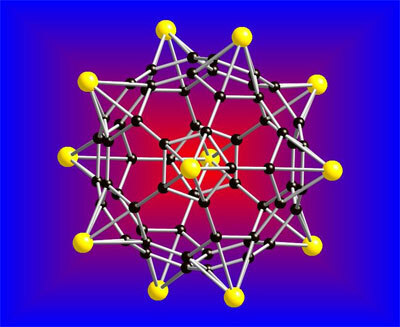 Essentially, the lithium buckyballs absorb the hydrogen, which means that one lithium atom can store five hydrogen molecules. According to Jena, the theoretical buckyball, which was designed using computer modeling, has 12 lithium atoms and can store 60 hydrogen molecules. Theoretical and experimental work by other researchers has proposed using titanium-coated buckyballs for hydrogen storage. However, those researchers observed that the titanium atoms had a tendency to react with each other and form clusters on the surface of the buckyball. Once clustering takes place, the properties of the buckyball are no longer effective for storing hydrogen in large quantities. Industry standards require materials that store hydrogen to have a high gravimetric density of 9 weight percent, and high volumetric density of 70 grams/liter. “The material that we have designed is capable of storing hydrogen at a gravimetric density of 13 weight percent – so it exceeds the industry target. Also, the volumetric density is approximately twice that of liquid hydrogen. This theoretical work has promise, provided one can make it in large enough quantities,” said Jena. This research is part of the Hydrogen Fuel Initiative, which was set in motion by the U.S. government in 2003 to address the limited supply of fossil fuels and its rising demand and costs. Fossil fuels are known to have an adverse environmental effect in the form of CO2 emissions. Global warming has been the result of CO2 emissions – the effects of which are observed world wide. Jena is currently collaborating with scientists who will conduct experiments to prove that hydrogen can be stored in the lithium buckyballs. Furthermore, these investigators will determine the necessary temperature and pressure conditions for storage and removal of hydrogen from the lithium buckyballs, and how to produce these materials in large quantities. This research was supported by a grant from the U.S. Department of Energy. These findings will also appear in the August 2 print version of the journal. Jena collaborated with Qiang Sun, Ph.D., who is affiliated with the INEST Group, Research Center at Phillip Morris USA; Qian Wang, Ph.D, a research associate professor at VCU; and Manuel Marquez, Ph.D., with the Research Center at Phillip Morris.